On the Thursday before Easter, we hold a joint service with our home churches to celebrate Maundy Thursday. Maundy Thursday is one of the lesser-known days of the Christian calendar and, were it not for the Maundy Ceremony, would probably have fallen into disuse altogether. It is the day before Good Friday. Maundy Thursday is the traditional English name for Thursday during Holy Week, so named because it is considered the anniversary of the institution of the Eucharist by Jesus at the Last Supper (that is, the mandatum novum or “new commandment”). The word "Maundy" is derived from the Latin mandatum meaning "command" - the same Latin root as mandatory and mandate. This is a reference to Christ's commandment to love one another, made at the Last Supper (the day before the crucifixion) when Jesus washed His disciples' feet. 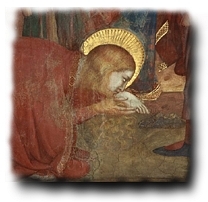 In some churches, Jesus' washing of the disciples' feet is symbolically reenacted. In our Grace Brethren tradition, we employ this reenactment as a normal part of our remembrance – the three-fold communion. Maundy Thursday has been celebrated since the earliest days of the Christian church, and the feet of pilgrims were washed by the clergy and nobility from at least the 4th century up until the mid 1700’s. Similarly, the giving of alms (gifts of money) to the poor on Maundy Thursday goes back to at least the 12th century. In Great Britain it has survived in its distribution, by the sovereign, of special “maundy money” to certain of the poor at Westminster Abbey, and from the 12th century onwards, the reigning sovereign has distributed these monetary gifts to the "deserving poor" on the Thursday of Holy Week in a ceremony known as the Royal Maundy. The sovereign also used to give food and clothing (later replaced by an allowance), and even washed the recipients' feet - this varied from sovereign to sovereign, the last monarch being James II. In the Roman Catholic Church, Maundy Thursday is a general communion day; a single Mass is sung, in the evening, and a Host, consecrated for the morrow, is placed in a specially adorned chapel of restfulness. The altars are stripped bare until the Easter vigil mass. From the earliest of days, the followers of Jesus told the story of his passion, death and resurrection. When pilgrims would come to Jerusalem, they would visit the sites where Jesus walked – the way of sorrows. These sites became important holy connections with Jesus for many – a dose of reality if you will. Eventually, following in the footsteps of the Lord, along the way of the cross, became a part of the pilgrimage visit. The stations, as we know them today, came about when it was no longer easy or even possible to visit these holy sites. In the 1500's, villages all over Europe started creating "replicas" of the way of the cross, with small shrines commemorating the places along the route in Jerusalem. Eventually, these shrines became the set of 14 stations we now know and were placed in almost every Catholic Church in the world. Click here to view the Stations Picture Guide that we used for our first Maundy Thursday Service, and to consider the way of sorrows looking forward to Good Friday. Afterward, we read of his promised hope, Christ rising, and we share communion. A “station” is a place of transition – crossing over from the average, to the extraordinary; a place of transition from the mundane, to the Holy; meeting with God. For weeks in advance of Resurrection Sunday, in our Churches, we have been exploring “Holiness,” giving attention to Holy thresholds, intentionally setting apart “time” to be with God. Slowing our hurried lives, to encounter God – just to be with Him. Now I know that Christmas and Easter (the resurrection) get the most press as being the high points of the Christian calendar, but for me, Maundy Thursday, and Good Friday (remembering our Lord’s suffering and death for us), hold the highest sentiment, and love. So, combining Holy Thursday and Good Friday into one remembrance can be a very emotional thing. They contain a reflection of our church values; employing many of the things that we hold dear. First, with our western mindset of consumerism, personal comfort, and living a “have-it-all” lifestyle, we value intentionally stopping life and selfishness to set apart time to think about just what it cost God to set things right. We gathered together to share our meal first (the fellowship, or laughter), working toward leaving our meeting hopeful, yet contemplative and somber as we intentionally carry the thoughts of Jesus’ pain and cost of loving us undeservedly. The service is Holy; containing our Ordinances, but probably most importantly, the command to Love each other; being with the marginalized, the hurt, the economically disadvantaged – the poor. After all, we are all poor – or at least called to it. We live certainly, in Laodicea, today in the US. With all of our advantages economically to do good, we neglect the poor. Spending time and dollars on our own comforts both personally, and within the church walls. Simply associating with (becoming true friends with), and taking care of the poor would make us rich in God’s eyes. It was personally humbling for me to remember Jesus’ sacrifice for All of us in the room; those who have jobs; middle class; those who had no home – who were taken in, and befriended; friends who’s ministry has just begun, being released from jail Monday, Wednesday, helping to give hope to another who was about to give up, and crying with us as we sung “Child of God;” those who can never hold a “normal job,” and folks who find, and are grateful for God’s provision in a dumpster. Within the context of this simple service, we have everything in common, observing the Stations of the Cross, the communion of the saints, the forgiveness of sins, loving each other, and blessing the least of these, in Jesus’ family. ** Certain portions above were obtained from, and used by permission of the Christian Resource Institute.